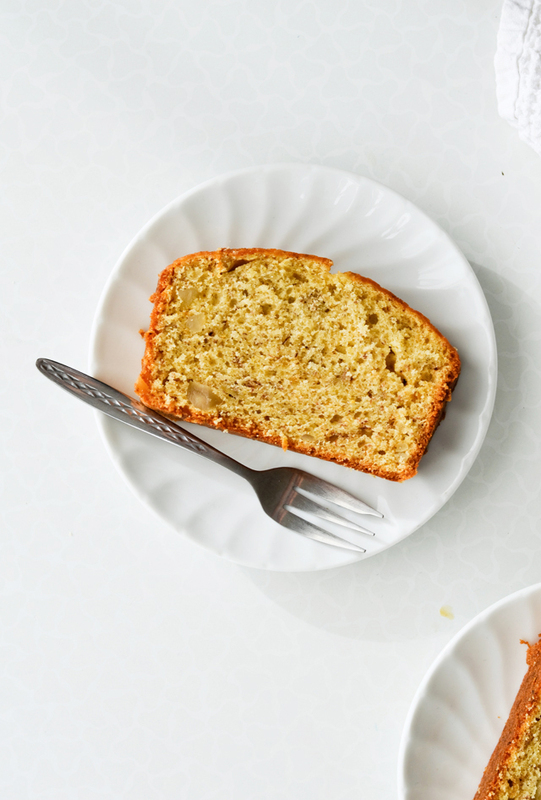 Orange banana bread with rum is here for you when you need a little pick me up! I don’t even know where to start, all I want to say is that Fall is amazing! The weather has been so incredible, warm above average for this time of year. I honestly feel guilty if I’m cooped up indoors, instead of spending time out in the sun. Clearly spending all my time outside isn’t realistic, I have stuff to do, we all do. But it’s hard! The perfect autumnal weather right now is the nature’s equivalent of a plate of fresh-baked, still warm, chocolate chip cookies that are placed on a table in front of you and you can’t have them. You can just watch. But no one can just watch that, right? You have to have at least one. Otherwise that’s just torture and I’m not playing like that. Instead of chocolate chip cookies, the smell coming out of my kitchen these days is that of my orange banana bread with rum. It’s really the most wonderful smell, so cozy and aromatic, it just makes me or anyone hungry. Forget candles or dust collecting potpourri, you can just make this instead. 100% natural Autumn coziness. And this banana bread is literally all I’ve been baking lately. Sometimes when I make something new and it’s a real success I just can’t get enough of it. And while this is a year-round recipe, it just fits this season so, so well. Rum and oranges? The thought of that alone makes me salivate (sorry for the TMI). 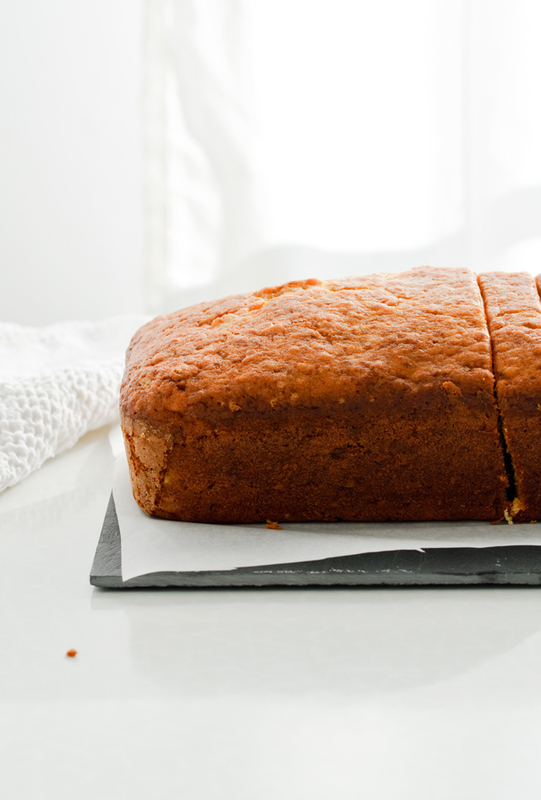 This orange banana bread with rum is everything you want in a banana bread: it’s moist and dense. It’s soft, yet crunchy thanks to the macadamia nuts. The taste will hit you in waves: the bananas, the rum, the beautiful orange. It’s a roller coaster ride for your palate, but not an overkill. It’ll leave you wanting more. 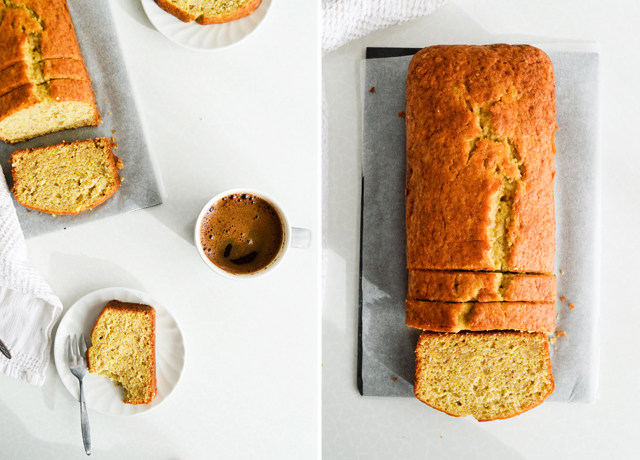 The great thing about banana bread, this one and in general, is that it freezes beautifully. You can freeze a whole loaf or individual slices, both defrost without a problem. And if you then heat it in the microwave for 10-20 seconds, it’ll come out warm and as aromatic as when you first baked it. If that’s not #winningatlife then I don’t know what is. 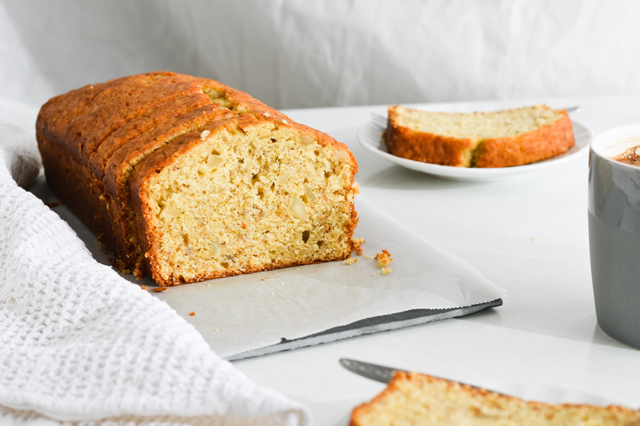 This orange banana bread with rum is moist and packed with flavor. Recipe makes one 12 x 5 x 3 – inch loaf, easily cut into 15 slices. Position a rack in the lower third of the oven and preheat the oven to 180°C (350°F). Grease (with butter or oil) the bottom and sides of 1 loaf pan (), dust with flour and line (at least the bottom) with parchment paper. Set aside. In a medium bowl, combine the flour, baking powder, baking soda and salt. 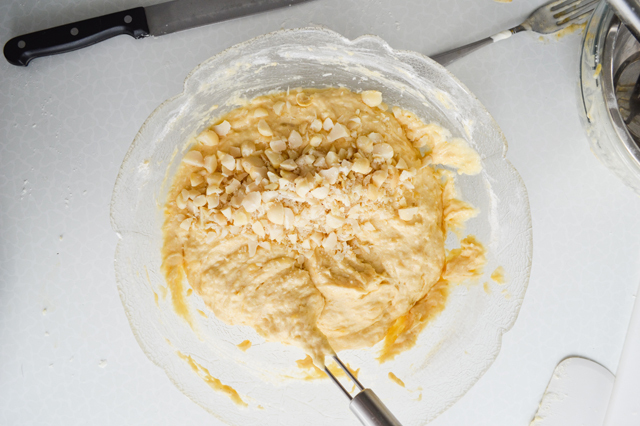 In another bowl, combine the mashed bananas, sour cream, vanilla paste, dark rum, orange juice and zest. Set aside. In a large bowl, or the bowl of your stand mixer fitted with the paddle attachment, cream the butter and sugar with a spatula. 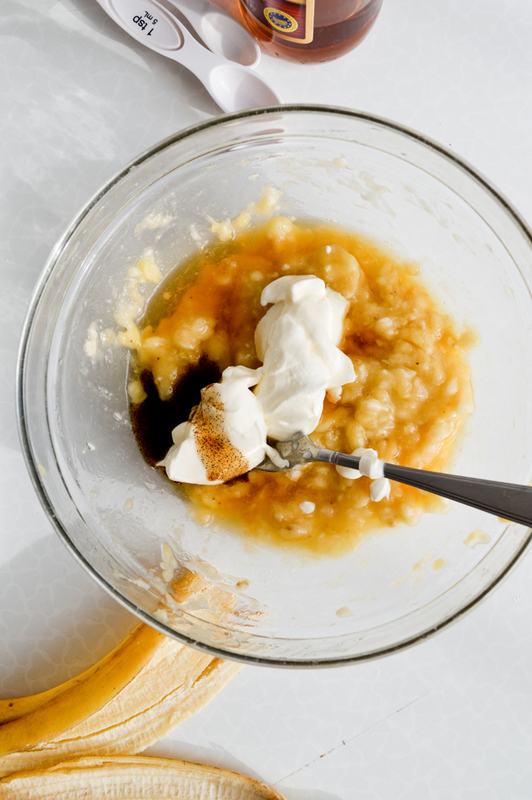 Stir and gently whisk until the sugar is well incorporated. Add the eggs one at a time, mixing well between each addition. Alternately add the flour and banana mixtures, beginning and ending with flour (flour – banana – flour – banana – flour). Stir just until incorporated (do not over mix!). Lastly, gently fold in the chopped nuts. 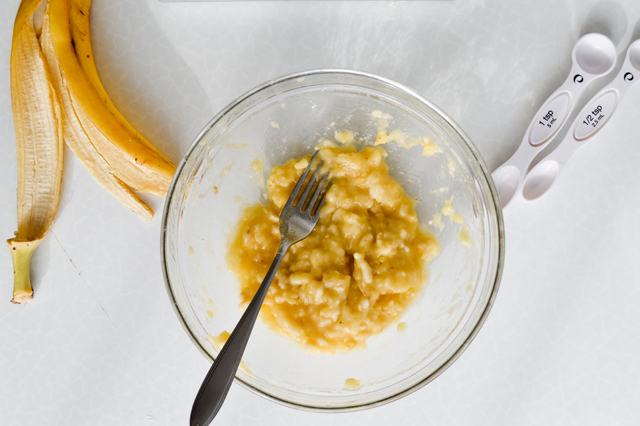 Transfer the batter to the prepared pan, scrape it out with a spatula, then smooth the top. Bake for 40 minutes, then reposition the rack and place it in the middle of the oven. Bake for another 10 minutes. Altogether, the baking time is between 45-60 minutes. Bake until the top is golden brown and a toothpick or skewer inserted in the center of the loaf comes out clean. If you gently press the loaf in the center, it should spring back without leaving an impression. Transfer the pan to a wire rack and cool for 10-15 minutes, then gently pull out the loaf (if using parchment paper) or turn the pan upside down close to the counter and gently tap the pan. Let the bread cool completely, or at least until it’s lukewarm to the touch (if you can’t wait), before cutting and serving. 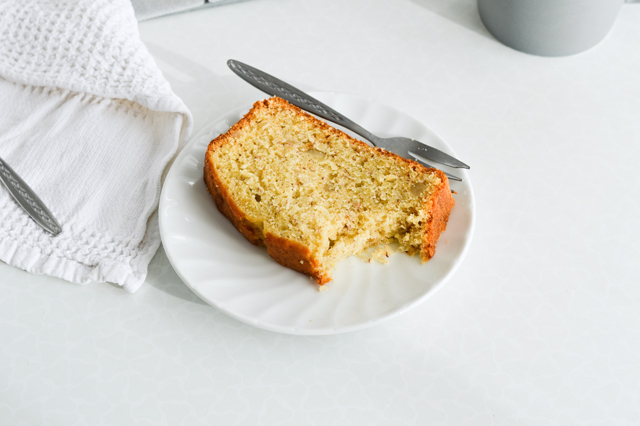 I make my banana bread in a 30 x 13 x 8 – cm (12 x 5 x 3 – inch) loaf pan. If you use a pan of different size, you might have to adjust the baking time. If you are allergic to nuts, you can easily leave them out. If you want any other kind, you can simply substitute the macadamia. Chocolate chips are great too, especially if semisweet. 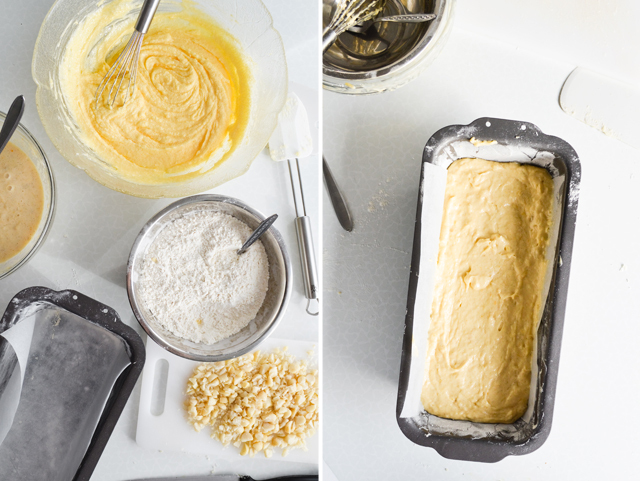 Store the bread in an airtight container or wrapped in plastic wrap at room temperature. It keeps for about 3-4 days, then it gets drier. Freezing: You can freeze the whole loaf or individual slices. Wrap them tightly in plastic wrap twice, then put in a container or ziplock bag and freeze. Thaw on the counter, at room temperature, or in the microwave (the defrost program is best for this) if you’re in a hurry. 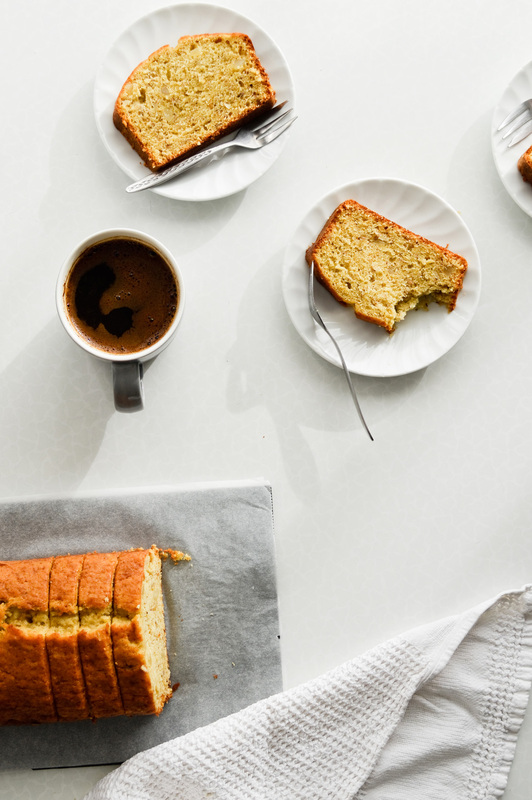 Recipe inspired by Flo Braker’s banana bread. This loaf looks heavenly! I really love your minimalist photography too. Yum! Hi Madeline, thank you so much! hope you enjoy the bread!